Epic rivalries define the careers of legendary fighters. Three rivalries during my own lifetime that come to mind are Muhammad Ali vs. Joe Frazier, Coban Lookchaomæsaitong vs. Ramon Dekkers and Artem Levin vs. Simon Marcus. If you’re thinking there’s a wild card in this deck: Gotcha! The “Lion of Prokopyevsk” veritably devoured Kaoklai Kænnorsingh in Chelyabinsk for the WBC World Light Heavyweight title on February 23, 2011. Artem’s dominance of the Thai giant killer – who’d historically subdued both the 14 lbs. heavier Clifton Brown and the monstrous Mighty Mo – instantly earned Levin the status of a Muay Thai rock star. American Joe Schilling’s subsequent first round ko of Kaoklai Kænnorsingh eight months later in Los Angeles set up a U.S. vs. Russia world light heavyweight title showdown. It was arranged for the following June at WBC’s “Battle of the Belts” in Bangkok. Claiming a crippling ACL injury, Levin blew off the fight. A month later, though, he fought Steven Wakeling in England. There was no conclusive outcome – owing to a draw – in Artem’s match with Wakeling. Owing to way too much flake for anyone to take, by the same token, WBC stripped Levin of his title and dropped him from its rankings. Glory 10’s World Middleweight Championship tournament in Chicago eventually brought Levin and Schilling together on September 28, 2013. “Stitch ‘Em Up” Joe took the measure of Artem’s trademark exposed chin in the second round with a wallop that flattened the heavily favored Russian. Beating the count with nothing to spare, neither was Levin spared a loss in the extra round decision. Artem would then win their rematch at Glory’s Last Man Standing tournament in Los Angeles on June 21, 2014. Again claiming injury, however, he pulled out of the Glory 24 rubber match with Schilling in Denver this past October. Soap operas like this might qualify technically as rivalry but not the kind that defines epic. Off Schilling’s win over Kaoklai Kænnorsingh back on October the 21st of 2011 – before his Glory World Series trick boxing interlude with the “Lion of Prokopyevsk” – “Stitch ‘Em Up” Joe had gone a FRMT 0-2 against Simon Marcus. This was prelude to Artem’s June of 2012 “Battle of the Belts” hiatus that reprised the Cold War nightmare of Mutually Assured Destruction (MAD). Whether going MAD pivoted more in Levin’s variation off the pathological than the geopolitical, truth or consequences left the American without a WBC world title to contend for and the Russian without one to defend. Ten months or so back to the future, the MAD Russian came FRMT calling on Simon Marcus, who’d twice beaten the American that Artem had just disdained to defend his WBC world title against. In the lexicon of this year’s U.S. Presidential election season, Levin lost in a landslide. Despite Simon’s taking his trick boxing lumps since then, their rematch was inconclusive at Glory 21 in San Diego, owing to a draw. Now down 0-1-1 against Canada’s FRMT undefeated cruiserweight, Artem’s prospects for a career defining epic rivalry found an inspiration in Sergey Busygin’s match making for Muay Thai Moscow on December 19, 2015. There could be no more auspicious showcase for the “Lion of Prokopyevsk” in his homeland than the UIC “Wings of the Soviets” Arena. Busygin’s inspired match making also featured a Russian army champion by way of honoring the nation’s commitment to defeating global terrorism. Instead of putting Artem’s rivalry with Simon Marcus onto a winning track, as the show’s promotion would’ve given him a chance to do, Levin ended up fighting WKN’s 36 year old European champ Daniel Alexandru from Romania. Serial truancy from dates with destiny typically doesn’t correlate with “legendary” in career search engines, no matter how many forfeited title belts adorn a photo op. On third contact off first bell, Artem trapped a waist high left round kick. Grabbing the erstwhile WKN European champ’s trapped leg like a joy stick, Levin selected a straight arm dump from his trick portfolio. It was a theme that he would play repeatedly, like a violin virtuoso, with variations on a punch line, from the very first stroke until the time came for the fat lady to sing. Except for his many clumsy pirouettes that found nothing but air, not one of Alexandru’s leg rotations went un-trapped. So attuned to the combative rhythm was Artem that he didn’t even bother to wait for Daniel to make a move before plucking the Romanian’s hamstring in a staccato solo approaching Requiem on his playlist. With so much quicker hands behind an expansive reach advantage, Levin was able to connect consistently, while the 36 year old couldn’t work out the coordinates to calibrate his own firing range. 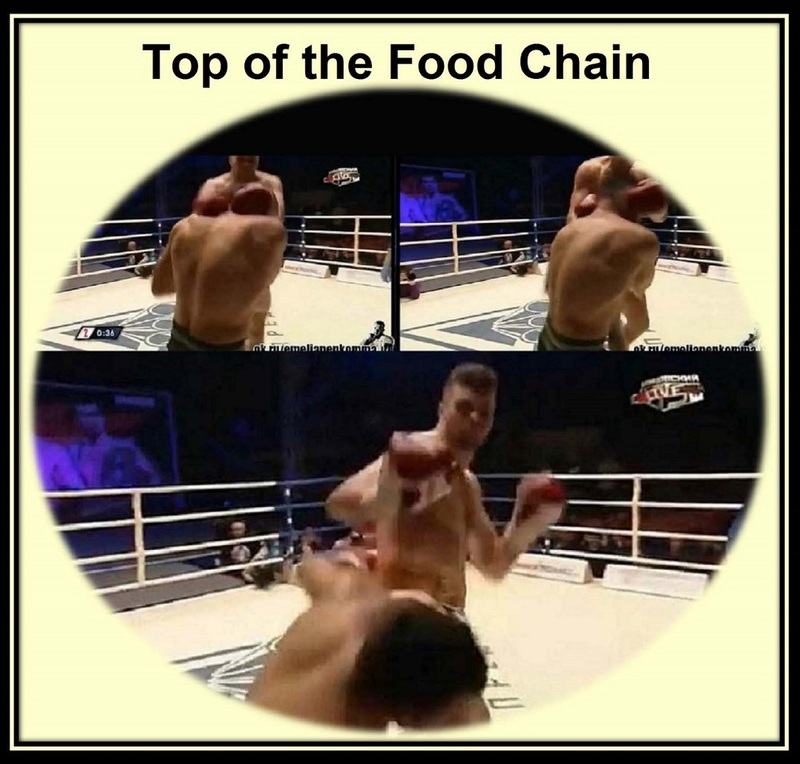 A stealth left uppercut brought congestion for Alexandru’s digestion, which might’ve distracted him from the knee on a collision course with his chest. It was a straight left to the chin, though, that knocked Daniel off his feet for a count from the ref. Less hurt than frustrated by the elusive Russian, Alexandru went to the clinch. They wrestled each other twice to the canvas. Round 1 ended the way it began, with Levin trapping the Romanian’s tepid round kick for a contemptuous chump dump. Go figure why the beleaguered Romanian seemed undecided whether to get off his stool for second bell. Stumbling through a missed over hand right, after taking a head jolting jab, Daniel exposed his chin to a quick left counter, which then transitioned into a Russian rhapsody in rock around the clock. When Levin trapped yet another futile leg rotation, this time he unloaded a bomb upside the 36 year old’s head. Off Alexandru’s wild right cross, which finally made a connection, Levin literally knee jerked into Daniel’s Facebook. There then ensued an unconventionally long recess for Artem’s corner to make adjustments so his cup wouldn’t runneth over. It seemed also to suit Alexandru, like any port in a storm. After Levin’s loose ends were tied back together, he launched a flying knee through the defensive perimeter, where Daniel’s guard had been on recess actually the entire fight. Unprepared for a right hand lead from Artem, the Romanian then got caught leaning into harm’s way. Daniel ended up getting dumped again, basically because he obviously couldn’t keep Levin from doing it to him. Unable to muster any kind of effective deterrent, never mind an offense, Alexandru became reckless. There’s a reason we recognize that it was a miracle for the biblical Daniel to make nice in the lion’s den. The “Lion of Prokopyevsk” made hamburger meat of out this mismatch, however, on the grinder of his knee. When the lion lays down with the lamb, better check what’s on the menu for dinner. This entry was posted in News & Results and tagged Alexey Ulyanov, Arslan Yallyev, Artem Levin, Artem Vakhitov, Cosmas Cheka, Daniel Alexandru, Edward Filbeger, Eldar Kenkerly, featured, Joe schilling, Jorge Loren, main featured, Marija Malenica, Most Featured, Muay Thai Moscow, Nikolay Ivanov, Sergey Busygin, Simon Marcus, Vyacheslav Gusev, Youssef Assouik, Yulia Berezikova. Bookmark the permalink.